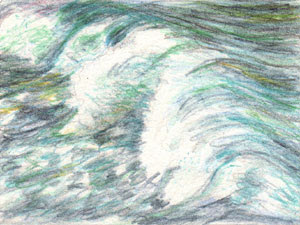 Sherry's Colored Pencil Corner: Illustration Friday - "Crash"
I didn't know what to draw for this one, but since I live within sight of the ocean I suppose it's not too surprising that I went with a crashing wave. It has a rather impressionist feel to it, which I quite like. Looks best from about five feet back. ;-) ACEO size, Polychromos on Somerset Satin White. I know how hard it can be to get that 'fluidity' with colored pencils. You did a good job. Lucky you living so close to the ocean. I like the impressionistic feel of this! Looks like you are doing great with mixing the colored pencil colors. I always struggle with that. Thanks, all, for looking and leaving comments!